"NOTICE: THIS IS EVENT HAS BEEN CANCELLED DUE TO LACK OF PARTICIPATION. NO MONIES WERE COLLECTED AND THE CONCEPT OF A HUNT FOR BIGFOOT WAS NOT A SCAM. MERELY AN EFFORT TO GATHER A LARGE GROUP OF PEOPLE WITH SIMILIAR INTERESTS TOGETHER FOR 4 DAYS OF FUN. While their were a few suspicious things surrounding it, I think the 'hoax' label is misleading. The advertisers/sponsors of the website were not in-fact sponsors. 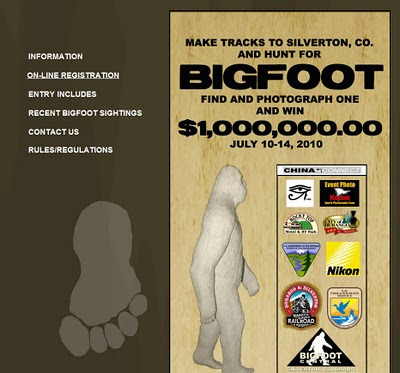 There has been confirmation that the "sponsors" have sent cease and desist letters to hunt4bigfoot.com. Are you saying Rick Lewis accidentally thought they were sponsoring his event?